As a geologist I continue to find scientific investigation of God’s world very satisfying and exhilarating. Dr. Snelling is the former editor of TJ in Australia. He holds a B.S. (hons) with first class honors in geology from the University of New South Wales and a Ph.D. in geology from the University of Sydney. Dr. Snelling has worked for more than 15 years in the area of creation research, first with Answers in Genesis in Australia, and now with the Institute for Creation Research in the United States. He is the author of a number of technical papers dealing with origins issues and, in particular, radioactive dating problems. So, why do I believe in the biblical account of creation by God over six literal days as the origin of life on earth, followed later by a year-long global geological catastrophe that totally renovated the earth’s surface, as described in the biblical account of Noah’s Flood? The reason is that the Bible clearly teaches a literal six-day creation and a global flood, not only in the opening chapters of the Book of Genesis, but also throughout the Old and New Testaments, including being confirmed by Jesus Christ himself. No matter how clever we scientists are in our research, we can only study all the evidence today (as it exists today) and then extrapolate backwards into the past. In doing so we have to make assumptions, and we can never be absolutely certain that our assumptions are correct and, therefore, our interpretation of what happened in the past is correct. On the other hand, the Bible claims over 3,000 times to be the Word of the transcendent, personal God, who has always existed, who is all knowing, and is totally truthful. If what we read in the Bible is true, then the evidence in the world that God created . . . should be consistent with what the Bible records about those events. It follows then that having made one’s decision about the reliability and truthfulness of these events as recorded in the Bible, ultimately by God himself as claimed, there is no reason why the truthfulness of the Bible cannot be tested historically and scientifically. That is not to say that the Bible is a textbook of science and history, but rather that if it is truth, then whenever it touches on matters of history and science, these should be verifiable by the normal means of scientific and historical investigations. To put it another way, if what we read in the Bible is true, then the evidence in the world that God created, and then judged by a global catastrophic flood, should be consistent with what the Bible records about those events. And so it is. I am convinced, as are many other scientists, that the evidence overwhelmingly supports these claims that the Bible makes about the origin of life and the history of the earth. For example, as a geologist I encounter many fossils in the rock layers exposed at the earth’s surface, being the remains of animals and plants that once lived on the earth but now are dead, buried, and preserved in the rocks. Like the biologists who study the living creatures, I can still see among the preserved remains of the dead creatures the evidence of God’s creative handiwork. Indeed, if life was created by a transcendent personal God, rather than the impersonal random mechanisms of evolution, then creatures, alive or dead, should show evidence of being designed by a designer. And they do. Perhaps my favorite example is that of the trilobites, arthropods (invertebrates with jointed legs) that are extinct and only found as fossils worldwide. They occur among the earliest fossils in the so-called Cambrian rocks, and are the lowermost multi-cellular fossils with hard parts found in the Grand Canyon, for example. Often regarded as primitive creatures, their anatomy reveals that they are, perhaps, the most complex ofall invertebrate creatures. They are thought to have been marine creatures, because their fossils are commonly found with the remains of creatures that still live in the oceans today. Furthermore, they appear to have had a set of gills associated with every leg. The animal’s shell is usually divisible into three sections or lobes—the head, thorax, and tail. Hence, the animal’s name (tri for three, and lobite for the lobes). Because of their jointed legs and antennae, the trilobites are classified with lobsters, crabs, scorpions, spiders, and insects. The legs require them to have had complex muscle systems, and because of their similarity to modern arthropods, trilobites are thought to have had a circulation system, including a heart. They also had a very complex nervous system, as indicated by antennae, which probably had a sensory function, and the presence of eyes on many species. Indeed, some scientists believe that the aggregate (schizochroal) eyes of some trilobites were the most sophisticated optical systems ever utilized by any organism. The schizochroal eye is a compound eye, made up of many single lenses, each specifically designed to correct for spherical aberration, thus allowing the trilobites to see an undistorted image under water. The elegant physical design of trilobite eyes also employs Fermat’s principle, Abbe’s sine law, Snell’s laws of refraction, and compensates for the optics of birefringent crystals. Such a vision system has all the evidence of being constructed by an exceedingly brilliant designer! The trilobite’s extraordinary complexity hardly warrants the creature being called “primitive,” but herein lies the dilemma for evolutionists. There are no possible evolutionary ancestors to the trilobites in the rock layers beneath where the trilobites are found, for example, in the Grand Canyon. In fact, the trilobites appear in the geological record suddenly, fully-formed and complexly integrated creatures with the most sophisticated optical systems ever utilized by any organism, without any hint or trace of an ancestor in the many rock layers beneath. There is absolutely no clue as to how the amazing complexity of trilobites arose, and thus they quite clearly argue for design and fiat creation, just as we would predict from the biblical account in Genesis. As a geologist I am also interested in the biblical account of earth history, particularly the record of the year-long global catastrophic Flood in the days of Noah that must have totally reshaped the entire surface of the globe. In fact, based upon the biblical description of the Flood event, it is logical to predict that it would leave behind billions of dead animals and plants buried in sediments eroded and deposited by the moving flood waters, that would all end up being fossils in rock layers laid down by water all over the globe. And that’s exactly what we find—layers of water-deposited sedimentary rocks containing fossils all over the earth. 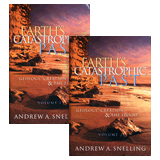 There is impressive evidence that fossil deposits and rock strata were formed catastrophically. There are also many indications that there were not millions of years, or even thousands, between various rock units. The rock sequence in the Grand Canyon is a case in point. Not only can it be shown that each of the rock units exposed in the walls of the canyon must have formed very rapidly under catastrophic watery conditions, but there are not significant time gaps between the various rock layers. Thus, the total time involved to put in place some 4,000 feet (1,200 meters) thickness of rock strata is well within the time constraints the Bible stipulates for the Flood event. What is also spectacular about the Grand Canyon area in northern Arizona is the scale and magnitude of the rock units and the awesomeness of the canyon itself. One can physically walk up and down the sequence of rock units that go back before the Flood, and then right through the Flood event up until post-Flood times. While the sequence is not complete, there are few places where such a complete sequence is so fully exposed and so much evidence for the Flood and its catastrophic nature. No geologist denies that the oceans once covered the land, since rocks containing marine fossils may be found at elevations above sea level today anywhere from one to five miles (1.6 to 8 km). That the ocean waters should have covered the land is exactly what one would expect to happen during a global flood, while earth movements concurrent with the retreating flood waters would be expected to leave strata with marine fossils now perched high and dry at considerable elevations, just as we observe, for example, in the Himalayas. In Australia, without doubt, one of the most impressive areas demonstrating catastrophic deposition during the Flood is Ayers Rock (or Uluru). The scale of the sandstone beds that have been upturned to form the rock gives clear testimony to the scale of deposition in the Flood. The mineral grains making up the sandstone are a witness to the cataclysmic speed of the deposition process and the young age of this awesome desert landform. Research has always been an important component of my responsibilities, and in recent years it has been possible to increase the research effort through collaborative work, and through focusing on investigating the radioactive dating methods by collecting samples and having laboratory work done ourselves. In this way the evidence that is being comprehensively gathered and systematized is proving to be totally consistent with the biblical record of creation in six days and a global catastrophic Flood. There are three important international collaborative projects. First is the Flood model project with U.S. creationists Drs. Steve Austin, John Baumgardner, Russ Humphreys, Larry Vardiman, and Kurt Wise. We are trying to build a comprehensive understanding of the geological data from a biblical perspective of earth history centred on what happened during the Flood, and before and after, up until the present day. We have suggested that catastrophic plate tectonics may provide a suitable mechanism for earth movements and tectonic activity, continental “sprint” (rather than “drift”), and patterns of sedimentation and volcanic activity during the Flood event. So we presented a preliminary paper on the topic at the Third International Conference on Creationism in Pittsburgh in 1994. Our model still has problems to overcome, but we remain confident it will prove to be workable and unifying. In a separate but related project, Dr. Kurt Wise and I, with technical computer support from Donna Richardson, and help from others with data collection, are developing a global geological database using sophisticated software that has been largely donated to us for this purpose. This project involves recording all the known geological data on every area across the globe—a mammoth and daunting task. The database will enable us to look at global geological patterns for different rock types, fossils, radiometric “dates,” indication in the rocks of former water current directions, and much more. By looking at the bigger picture, we hope to get a better understanding of what happened during the Flood. After all, the Flood was a global event; therefore we would expect to find global patterns of sedimentation, volcanic activity, mineral deposits, etc. Though a long-term project, this is strategic because it will allow us to make important pronouncements based on hard data. In a sub-project, we have teamed up with astronomer Dr. Danny Faulkner to look at the patterns of impact and explosive volcanic cratering with the passage of the geological record on the earth, compared with that of the moon and our closest planetary neighbors, Venus and Mars. There is a distinct possibility that such impacts and explosions triggered cycles of catastrophic sedimentation during the Flood, volcanic activity in conjunction with plate movements, and more. A third international collaborative project is focused on the radioactive dating methods. Though easily discredited because of the basic flaws in the methods and the anomalous results, patterns of “dates” that are consistent with the evolutionary time scale are still a major challenge to the biblical account of earth history. It would be a powerful advance to be able to explain the “good” data accepted by the evolutionists and the anomalous data they reject, in terms other than “ages.” So I am working with Drs. Steve Austin, John Baumgardner, Eugene Chaffin, Don DeYoung, Russ Humphreys, and Larry Vardiman on the RATE (Radioisotopes and the Age of The Earth) research project. Thus far, two possibilities have emerged—radioactive decay rates may have been very rapid at the time of creation and/or the Flood, and/or the “ages” represent patterns connected to the primordial geochemical make-up of the earth’s interior, particularly the mantle, and to processes of recycling of rocks during the Flood. Linked into my participation in the RATE project are an increasing number of case studies in which particular geological units are targeted for sampling and laboratory work, in order to test possible geochemical explanations for the radioisotopic ratios in the rocks. So far these case studies involve samples from Australia, New Zealand, the United Kingdom, the Grand Canyon, and elsewhere in the USA. Initial results are proving to be significantly helpful in our quest. For example, anomalous “ages” of up to 3.5 million years have been found for 1954 lava flows at Mt. Ngauruhoe on the North Island of New Zealand, and it has been demonstrated that these have been caused by excess radiogenic argon that has come from the mantle source area for these lavas and been trapped in the lavas when they cooled. Furthermore, a survey of the literature confirms that this argon gas may reflect the primordial argon concentration in the earth’s mantle and not have been derived from radioactive decay, even though it is indistinguishable from argon so produced. This, in turn, means that in the case of ancient lava flows where we do not know their true age, we cannot be sure that the argon gas measured in the rocks comes from radioactive decay of potassium, and thus the measured argon gas cannot be a true reflection of “age,” contrary to the principles involved in the potassium-argon and argon-argon radioactive dating methods. This work was reported in a paper delivered to the Fourth International Conference on Creationism in Pittsburgh in 1998 and won the Technical Excellence Award. Other research projects have likewise been targeted at specific geological issues that for a long time have seemingly been at odds with the biblical record of earth history, and which have been baffling to solve. Two such issues are the metamorphic changes in rocks over large regions of the earth’s crust due to elevated temperatures and pressures, and the emplacement and cooling within the earth’s crust of large bodies of molten rock such as granites. Both of these geological processes have been regarded conventionally as taking millions of years and so have been persistently cited by those antagonistic to the biblical time scale for the creation of life and of earth history. However, papers in TJ and presented at the Third International Conference on Creationism, both in 1994, have shown how the regional metamorphic changes only require low to moderate temperatures over a short time scale in the presence of hydrothermal waters and reflect the compositional zonations of the original sediments and constituent minerals. The latter paper won the Technical Excellence Award at that conference. Likewise, it now has been demonstrated in a paper presented at the Fourth International Conference on Creationism in 1998 that the intrusion and cooling of large bodies of granitic magma only require hundreds to a few thousand years, the expulsion of contained magmatic water inducing fracturing and concurrent rapid convective heat loss via its mixing and circulation with ground water. Research into these and other geological issues thus continues to verify the accuracy of the biblical account of the history of the earth and of life. I believe in the creation of life by God in six literal days, and in God’s destruction of life and the earth by a year-long cataclysmic global Flood, for two reasons—first, and foremost, because the Bible clearly records these events as real, literal history, and second, because the scientific evidence, correctly understood, is totally consistent with this biblical account. As a geologist I continue to find scientific investigation of God’s world very satisfying and exhilarating, because I always discover that ultimately the evidence in God’s world agrees with what I read in God’s Word. Can any scientist with a Ph.D. believe in the idea of a literal six-day creation? 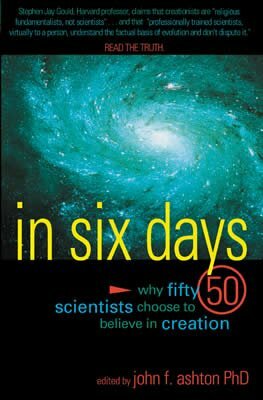 In Six Days answers this provocative question with 50 informative essays by scientists who say “Yes!” Taking a factual and scientific look at the evidence for evolution, physicists, biologists, and chemists conclude that evolution may offer no more evidence than traditional religion, and factually, it may lag behind. How Could A Loving God...?